The Indy asked Santa Barbara historian Erin Graffy to tell the tale of three presidentes and the saddle that took them on a Fiesta ride. 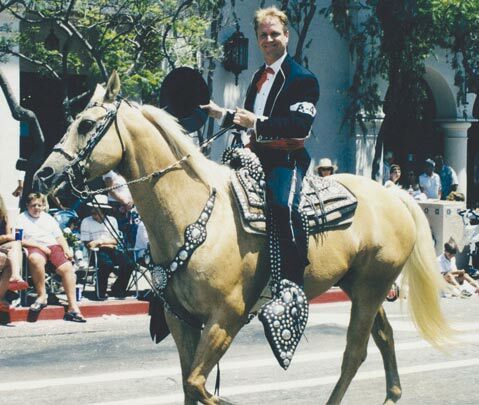 When a blue-eyed blond takes over the reins for this year’s Old Spanish Days Fiesta, don’t assume he is a Johnny-come-lately to our community, immune to its Hispanic heritage. El Presidente Dennis Rickard is the great-great-grandson of José de la Guerra, the last comandante of the presidio and patriarch of the first family of Santa Barbara in the 19th century. However, the charm of Fiesta is that it is incredibly inclusive. It isn’t meant for just the Spanish descendientes and those of Mexican heritage to participate, and for the rest to look on. Fiesta is a time when all are welcome to participate in the celebration ​— ​an Old Spanish Days party. In the latter part of the 19th century​— ​after California became a U.S. state, even as the language changed from Spanish to English, the dress morphed from side-split breeches to long unadorned straight pants, and lace mantillas gave way to cotton bonnets​— ​there was still a nostalgia for those halcyon “old Spanish days” of California celebrations. Those new to town were willing to embrace the local culture since they sensed it was so important. So Spanish descendientes such as the Ruiz and Cota families readily brought immigrants like the More, Den, Packard, and Dreyfus clans into the fold, teaching them the traditional Spanish dances to perform for President Benjamin Harrison in 1891. This inclusiveness was readily seen when business and community leaders conceived of the first Old Spanish Days celebration: The planning committee included old-time Spanish families and new faces eager to participate and incorporate the town’s love of history. This all-embracing mind-set is demonstrated by the diversity in ethnicity and heritage of Fiesta’s presidentes ever since. Some presidents have been Native Sons or Daughters of California (Ellen Harte, Rudy Castillo); some were scions of Yankee pioneers (J.J. Hollister); others have been sons of European immigrants (Bob Kallman, George Castagnola, Ralph McNall); and some were immigrants themselves, such as Meta Duell, born in Germany, or Michael Lemus, born in Mexico. Of course, several have been presidio soldier descendants, such as Bill Luton, Charles Storke, and Wendy Ayala. The first official presidente, Dwight Murphy, was elected the second year of Fiesta and served 1925-1926. He came from Pennsylvania and immersed himself in the community as a quiet, behind-the-scenes leader and philanthropist. 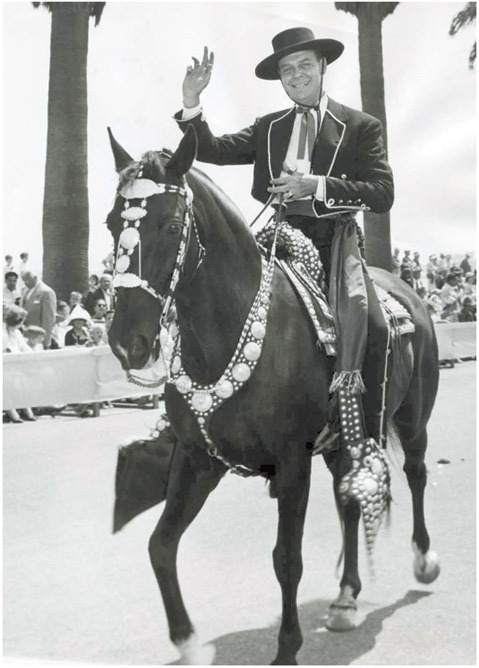 He bred the golden palomino back from near extinction, and it became a feature in Fiesta’s historic parade, for which Murphy played a leading role. The second presidente was county supervisor Sam Stanwood, who served Fiesta for 20 years from 1927-1947. Although Sam was a native son, born in Santa Barbara in 1870, his parents were New Englanders through and through, hailing from Maine. For almost the entire time Stanwood served as el presidente, he was also serving as county supervisor. The continuity of his leadership did much to secure stability for the organization in its formative years. His longevity in office (25-plus years) as county supervisor gave him an opportunity to take advantage of his political contacts. Stanwood built the County Bowl as a Works Progress Administration project to provide a natural setting/stage for the historic musical pageants presented every Fiesta by Charles Pressley, another newcomer to town. Stanwood was injured in an automobile accident and resigned his leadership role in 1947. The board of directors appointed a new president to pick up the reins and hopefully provide vision and insight. John “Jack” Rickard took over Fiesta at the age of 34, the youngest president in the history of the organization. Jack Rickard’s father, James Rickard, was a newcomer to Santa Barbara when he married Teresa Acacia Oreña, the youngest daughter of the youngest daughter of José de la Guerra. The elder Rickard quickly adopted the Spanish California culture. His children were raised out on the family land Rancho El Encinitas in Los Alamos, where they all spoke Spanish as their first language until they entered school in Santa Barbara. James was president of the La Primavera Association ​— ​a forerunner of Old Spanish Days ​— ​which celebrated Santa Barbara’s history through the arts and pageantry. He was also a founding director of Old Spanish Days Fiesta. James’s son, Jack Rickard, was steeped in local culture and ready to initiate refreshing changes to Old Spanish Days when he came to the fore in 1948. Jack moved the mercados ​— ​which were a hodgepodge of booths and tables selling wares in El Paseo courtyard ​— ​to De la Guerra Plaza. His cousin, the architect Robert Ingle Hoyt, designed a new market of palm-covered ramadas, where nonprofit organizations sold food and vendors hawked specialty handicrafts. Under his aegis, Old Spanish Days put a focus back onto history. The Spirit of Fiesta was created for the El Desfile Histórico (the Historic Parade), as were the Flower Girls, who were to follow her along the route. Sixty-five years ago, Jack also introduced the tradition of the El Presidente Party (Recepción del Presidente), holding the premiere soirée the night before Fiesta began at his Oreña Rancho El Encinal at Los Alamos on July 24, 1949. The event continued for a good number of years being presented and hosted by the presidentes to thank the board and volunteers for all their work in planning and for the work they were about to engage in during the upcoming week. Succeeding presidentes held the soirée at the original “old Spanish days” homes in Santa Barbara (now at the site of the Santa Barbara Historical Museum). These adobes consisted of the “old adobe,” as it was called, and the Covarrubias Adobe. They held specific historic importance for those who sought to honor Santa Barbara’s roots since they were home to the most distinguished families of old California: the Carrillos, Picos, and Covarrubias. Since 1998, the El Presidente Party has been held at Fess Parker’s DoubleTree Resort in the rotunda and is presented and produced by the Old Spanish Days organization. El presidente of 2014, Dennis Rickard will be the third son to follow his father in the presidente role ​— ​Bill Luton Jr. (1988) became the leader nearly 20 years after his father (Bill Sr., 1970), Bob Kallman served in 1968, and his son, Kris Kallman, served in 1994. Growing up on the family ancestral ranches in North County, Dennis is long accustomed to sitting in the saddle. Rancho Rinconada de Cuyama and Oreña Rancho El Encinal at Los Alamos were part of the original land grants the family acquired around 1848 and remain working cattle ranches today. When he joined the Old Spanish Days organization more than a dozen years ago, Dennis devoted most of his time to working with the parade. With an average of 500-600 horses and riders participating, it is considered the largest annual equestrian parade in the nation. Dennis grew up with many of the riders and outriders, who came from neighboring ranches and have been part of the parade for decades. 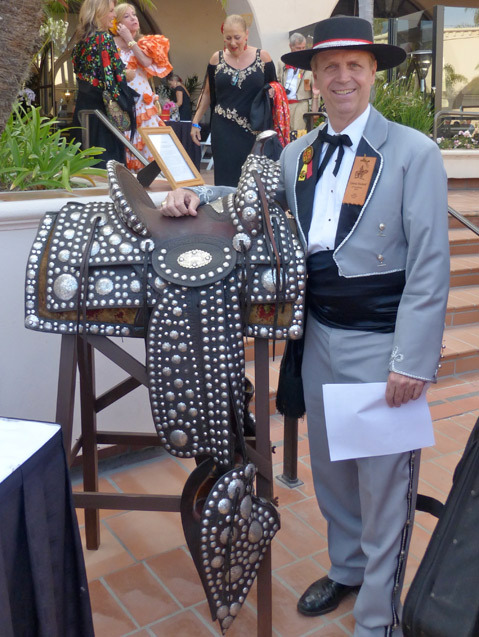 <b>RIDING TALL:</b> This year’s El Presidente, Dennis Rickard, poses with the saddle his grandfather, James Rickard, had made in the 1920s by renowned saddle maker Luis Ortega and master silversmith John Field. 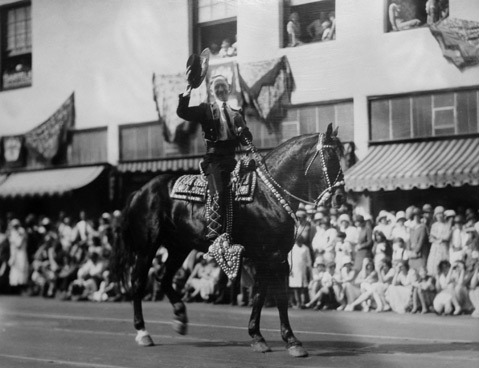 Dennis’s father, John “Jack” Rickard, also used this saddle when he rode in the Fiesta Parade as El Presidente in 1948-49. For the 2014 parade, Dennis will be literally riding out on antiquity; he will be using the saddle his grandfather James Rickard had made in the 1920s by famed saddle maker Luis Ortega. A stunning piece of craftsmanship, it is adorned with more than 1,940 pieces of silver hand-pressed by master silversmith John Field. Moreover, Dennis’s father, Jack Rickard, also rode with that saddle when he served as el presidente in 1949. The saddle will be reprised in one more guest appearance at the end of this year ​— ​Old Spanish Days Fiesta received an unprecedented invitation to appear in the Rose Parade on New Year’s Day 2015. This will be the first time in more than 60 years that Santa Barbara will be featured in the parade, which has a worldwide viewing audience of 54 million. The entry will be an equestrian unit highlighting the historic wedding of Anita de la Guerra to Bostonian Alfred Robinson in 1836.